Beth Corteville kindly shared an image of her finished Daily Duffle bag! Didn't it turn out great! 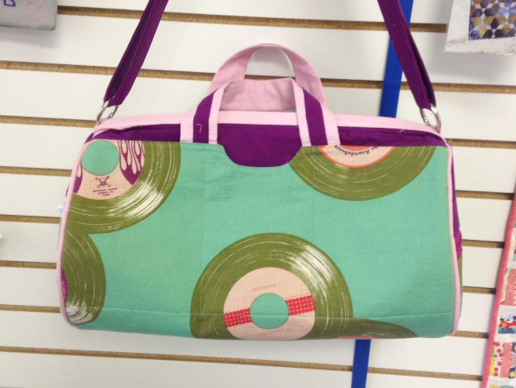 I love the Melody Miller record fabric Beth used for the outside bag body. It gives the bag a fun vintage feel! Our communications with Beth gave us a few more helpful hints for this bag! When sewing the pieces together and trying to stay near the piping, try using a stitch-in-the-ditch foot. Also, use a heavier needle, such as a jeans or leather needle. That will make sewing through all those layers much easier! Big thank you Beth for sharing her Daily Duffle with us! The Daily Duffle pattern is available in PDF and paper form. If you make this or any other Sassafras Lane pattern, we would love to see it! Send us photos or post them to our Flickr group. Thanks for stopping by!